Welcome to the 5M7 Website! The Lions, Lioness and Leos of District 5M7 number over 2,000 strong. 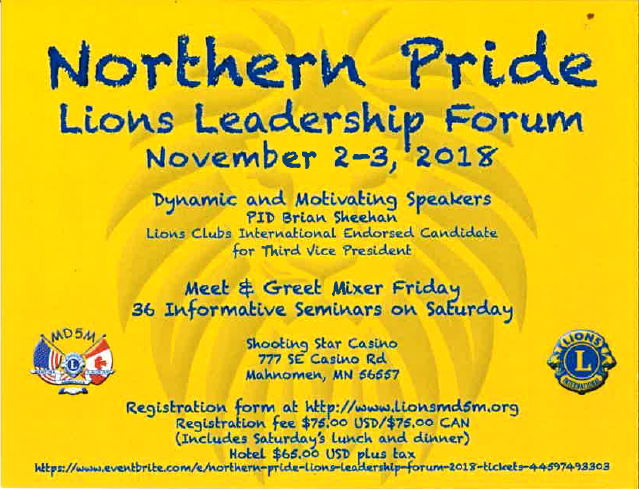 Lions are organized into 52 Clubs in 6 counties in Minnesota. In addition, there are 9 Lioness Clubs and over 120 Leos in 4 Leos Clubs. We proudly serve our communities and the world in a multitude of ways. To add or update any item on this site, please e-mail 5M7web@gmail.com. To request club events to be added to the calendar, please click Add Calendar Event or e-mail the details to: 5M7web@gmail.com. In 1975, Lions Clubs International Board of Directors voted to recognize groups of women who had been serving in Lions clubs auxiliaries all over the world. Some of the auxiliaries had been in existence and service in Lionism for nearly 50 years. For the first time, these woman's groups were united under one name, one banner, one emblem and one constitution. Lioness Clubs support their sponsoring Lions Club in a variety of service activities in addition to planning and implementing projects of their own in their community. Lioness members are women who take an active interest in the cultural and social welfare of the community in which they live. They believe citizens joined together can initiate and carry out programs which will make their community and the world a better place in which to live. The staying power of Lioness Clubs in District 5M7 indicates it meets the needs of women who wish to unite with other women in community ad humanitarian service. District 5M7 Lionss Clubs are guided by a Lioness Associate. Lions Clubs International is the world's largest service club organization. We have 1.37 million members in more than 46,000 clubs in more than 210 countries and geographic areas.